Dressing up your summer shoes. Dressing up in summer is damn near impossible. You can’t wear a blazer. Wool dress pants are out of the question. Rocking a tie with shorts makes you look like Angus Young at best, or a little boy in Sunday School at worst. So if you’re already wearing a button up shirt and flat front shorts, how do you take it from grilling in a friend’s back yard to nailing a high-stakes first date? The trick is in how you ground the outfit. The old adage, “You can tell a lot about a man by his shoes,” has many layers to it. But perhaps the most important is all the things you can assume about a man based solely on his choice in footwear. What kind of crowd he runs in to simply how well he takes care of the things he purchases. Are these correct reflections of reality? Likely no – they’re assumptions – but their inaccuracy doesn’t keep people from making them. And when you’re intentionally looking to dress to impress, these assumptions have to be considered, whether we like them or not. Boat shoes are near universal summer footwear but what do you reach for when you’re looking for that little something extra? The answer: the driving moc. Known also as driving loafers or car shoes, the driving moccasin is a dressy summer shoe alternative not only because of it’s design, but of its history with the upper class. In 1963, Italian footwear company The Car Shoe designed the driving moc to be a flexible – but more importantly comfortable – alternative for race car drivers. Up until this point, drivers wore clunky, stiff soled shoes and boots, and if you’ve ever driven a couple hours in a pair of Red Wings you know just how uncomfortable shoes can be when they’re designed to put miles on the ground, not behind the wheel. Pick up a pair of Sebago Tirso Ties on Amazon for $150. Driving mocs are constructed with a single layer of leather, with the originals including pebbled soles. The placement of rubber pebbles on the footbed instead of a thick rubber sole offers ease of movement and comfort while driving, and including them on the back of the shoe reduces wear caused by resting the shoes on the floor of the car while driving. The mocs sold by The Car Shoe were available only to the rich, and while intended for behind the wheel, quickly became status symbols off the track for gents who could afford to spend hundreds of dollars on shoes intended just for driving. Soon, Diego Della Valle formed the Tod’s shoe brand, offering driving loafers at a fraction of the cost, but still very much a luxury brand, with current models selling well into the hundreds of dollars. But you don’t need to skip a rent payment to look great this summer. Our pick is the Tirso Tie from Sebago. Founded in Michigan in 1946, Sebago (pronounced Seh-bay-go) has a long history of also providing functional footwear with a stylish form, notably with their boat shoes, including being the official supplier of yachting footwear for the US Sailing Team. You may notice the Tirso Tie is lacking a common component of driving mocs: the pebbled sole. I’ve owned versions that included pebbled soles, but they have a way of “casualizing” an outfit. The Tirso Tie is an amalgamation of the boat shoe, driving moc, and loafer – its low profile “pad” sole creating a more elegant and dressier silhouette. Still handmade, the Tirso Tie is a smart choice for any gent looking to up his summer style game. The Tirso Tie also features a very helpful addition: A foamy insole that adds all-day comfort and an anti-bacterial/anti-fungal treatment that helps prevent odors and regulates sweating. Shown here in Cognac, pick up a pair on Amazon for $150 or check out Sebago’s site for more information. The Sebago Tirso Tie's were featured in our How to Dress Well in Summer Heat Getup. Driving loafer are great and I really like those ones. I’ve got a pair of penny-loafer style drivers from J&M when I used to work there. These Sebagos might have to be my next ones. P.S. I like this series on summer shoes, I hope you do one on camp mocs. Looks like a nice alternative to a boat shoe, but I have a question: does the lesser amount of rubber on the sole inhibit its use as a normal walking shoe, or does it hold up like a boat shoe would? It was all good until the logo blasted on the heel…not a fan. Is it just me or do these appear as though they would barely make it through a full summer of wear? 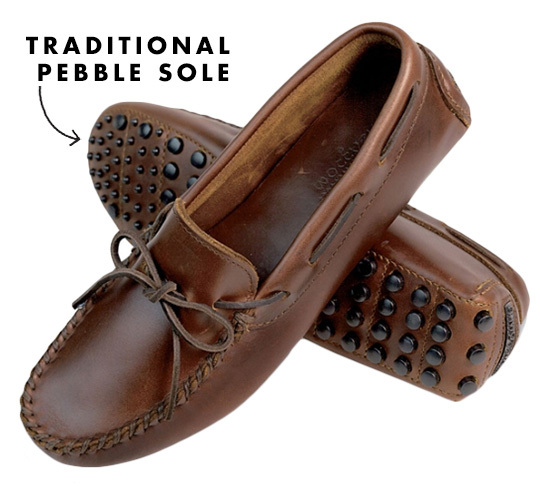 I mean even in a typical pebble bottoms driving moc they tend to extend the tred a touch you don’t wear them down right away but these seem to have almost no sole at all. I mean I assume they can be resoled, but 150 for a shoe that appears like it won’t make it through a full summer seems a bit much.